MICHAEL JACKSON’S doctor killed the King of Pop, a jury ruled last night. 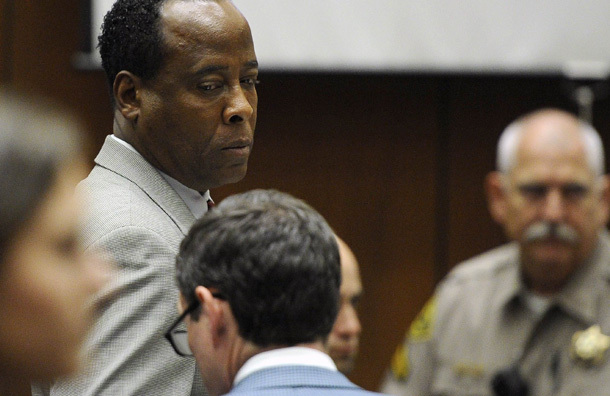 Dr Conrad Murray was handcuffed and taken to jail to await sentence on November 29. The judge said he was a convicted felon whose crime had “resulted in the death of another human being”. Murray, Jackson’s personal physician, was found guilty of involuntary manslaughter over his use of propofol, the super-strong surgical anaesthetic that caused Jacko’s lonely death. The jury ruled unanimously that he had been criminally negligent. There was a cry from a woman on the public benches as the verdict was announced at Los Angeles Superior Court. Murray, 58, now faces up to four years in jail and the end of his medical career. But if he is jailed, he may only serve a few months. He looked intently at the court clerk as she read the unanimous verdict, then turned to look at the jury. He looked exhausted, and showed no emotion. There were shouts of delight from hundreds of placard-waving Jackson fans who had gathered outside court. Judge Michael Pastor refused Murray bail, and two guards moved in to handcuff him before leading him from court. Around 15 of Jackson’s relatives, including mum Katherine, dad Joe, brother Randy and sisters LaToya and Rebbie, were in court for the verdict. They wept quietly as Murray was convicted. Murray repeatedly used propofol, a drug Jackson called his “milk”, to help the star sleep. He told police he gave Jacko drug every night for six weeks. A succession of experts said propofol was so powerful that it should never be given outside hospitals. In his summing-up, prosecutor David Walgren accused Murray of “an obscene pharmaceutical experiment” on Jackson. He showed the jury pictures of Jackson’s children, Prince Michael, 14, Paris, 13, and Blanket, nine, and said: “For them, this case doesn’t end today, or tomorrow. “For Michael’s children, this case will go on forever, because they do not have a father. Murray’s lawyer, Ed Chernoff, said no crime had been committed. He argued that Jackson, an insomniac with a long history of prescription drug problems, injected himself with propofol behind Murray’s back. Chernoff suggested Jackson had also been given other drugs by other doctors, and described Murray as “a little fish in a big, dirty pond”. The case against Murray took two years to bring to court. The trial lasted 23 days, heard from 49 witnesses and looked at more than 300 pieces of evidence. Murray did not take the stand in his own defence. The jury was made up of seven men and five women – six white, five Hispanic and one black. They deliberated for nine hours over two days before pressing a buzzer three times to tell the judge they had reached a verdict. They asked no questions, and did not ask for any evidence to be read back to them. The jury sent their buzzer message at 10.56am local time. Judge Pastor delayed the reading of the verdict for two hours to allow Jackson’s relatives and others to get to court. Murray had known Jackson since 2006, when he treated Paris for a minor illness in Las Vegas, where he had a medical practice. The star considered him a friend. Jackson hired Murray as his personal physician just six weeks before his death in 2009, at the age of 50. He wanted Murray to help him prepare for his gruelling nine-month series of 50 comeback concerts for 750,000 fans at London’s O2 Arena. The doctor was promised $150,000 (£93,000) a month but never got a penny. Jackson died before he could sign his contract. Jackson seemed alert and enthusiastic at the rehearsals for his London shows. But the jury heard a recording of the star, his voice shockingly slurred, talking to Murray about six weeks before his death. He was apparently under the influence of drugs. When Jacko hired him, Murray was nearly £500,000 in debt. He hadn’t paid his mortgage in months and owed tens of thousands in bank loans, leasing payments and unpaid child support. He has fathered at least seven children by a number of different women. Walgren painted a picture of a star-struck, incompetent, irresponsible doctor who was scared to say no to his boss – and lose the £93,000-a-month meal ticket he desperately needed. A large part of Murray’s work for Jackson involved trying to help him sleep. He would tend to him during the night at his rented mansion in Holmby Hills, Los Angeles. A pharmacist told the trial that Murray ordered 255 vials of propofol from him, without saying who they were for. Murray had packages of drugs delivered to the home of his girlfriend. In all, the prosecution claimed, he ordered four gallons of propofol. Walgren said he gave Jackson the dangerous drug without keeping records or using proper monitoring equipment. Chernoff said Jackson was already a drug addict when Murray started working for him, and his client had tried to wean him off propofol. He claimed that the propofol dose Murray admitted giving Jackson just before his death was too small to have killed him. Jackson suffered his fatal collapse on the morning of June 25, 2009, in his bedroom at the Holmby Hills mansion. Murray, it was claimed, had given him a large dose of propofol, then left him alone to make some phone calls. The court heard he was talking on his mobile to one of his women friends, cocktail waitress Sade Anding, when he realised Jackson was not breathing. Anding said Murray disappeared abruptly from the other end of the line. Walgren said Murray panicked and took 20 minutes to call an ambulance, and told a bodyguard to hide vials of propofol before raising the alarm. The bodyguard said Jackson had an IV line in his leg that led to a saline drip bottle on a stand. Walgren said the bag contained a bottle of propofol. Murray tried to perform CPR on the lifeless Jackson, but only used one hand. And it would not have worked in any case, because the star was still lying on a soft mattress. At one point, he asked Jackson’s frantic guards: “Does anyone know CPR?” He also failed to tell the paramedics who arrived at the house that Jackson had been given propofol. Murray went with Jackson in the ambulance to hospital, calling girlfriend Nicole Alvarez on the phone as he did so. Jackson was pronounced dead at the hospital. Walgren said Murray fled before the star’s devastated family could talk to him. A coroner later ruled he had died of “acute propofol intoxication”, in conjunction with two other sedatives. Judge Pastor must now decide whether to jail Murray or give him probation. If he is locked up, he is likely to be freed far short of his full term because of chronic overcrowding in LA’s jails.